You may have heard about the Georgia campaign against childhood obesity that has started a major conversation around the country. Many bloggers seem to have opinions about the controversial ads. Since I have written several posts related to childhood obesity, I thought I should chime in, as well. To put it bluntly, I don't like the ads. I find them offensive and unhelpful. The ads feature pictures of overweight children with captions like, "It's hard to be a little girl if you're not." They were intended to grab the attention of passers-by and to get a conversation started. As I mentioned in my post on Childhood Obesity and Food Insecurity, the organization that ran this campaign, Strong4Life, conducted a study which showed that 75% of parents of obese children in Georgia do not think their child has a problem. So start the conversation they did, by thrusting all the negative stereotypes of obesity even more directly in the faces of the public. My main gripe with this ad campaign is that it fuels the negativity about physical appearance with which overweight children are almost certainly already bombarded on a regular basis. Now don't get me wrong. I do think childhood obesity is a serious problem. I think doctors need to be straight with parents. I think parents need to come to grips with reality. And I even think it's ok to discuss your child's weight problem with him or her under most circumstances. But I do NOT think it is ok to make this an issue of physical appearance. While the ads may have aimed to show many effects of obesity through their captions, the message they sent loudest of all was, "See the image of this body? It is not acceptable. And you need to fix it." I believe the appropriate way to address the issue of childhood obesity is from the perspective of the health and lifestyle effects of carrying excess weight. This focus shows concern for a person's well-being, not critical or self-righteous judgment. According to the Centers for Disease Control and Prevention (CDC), in a study of five to seventeen year olds, 70% of obese youth had at least one risk factor for cardiovascular disease. Obese adolescents are more likely to develop prediabetes, a condition of elevated blood glucose that can lead to type II diabetes. According to the Mayo Clinic, type II diabetes itself, which used to be called "adult onset diabetes," is growing in prevalence among children, largely due to the obesity epidemic. The CDC also states, "One study showed that children who became obese as early as age 2 were more likely to be obese as adults....and are therefore more at risk for adult health problems, such as heart disease, type 2 diabetes, stroke, several types of cancer, and osteoarthritis." Unfortunately, the negative effects of obesity don't end there. 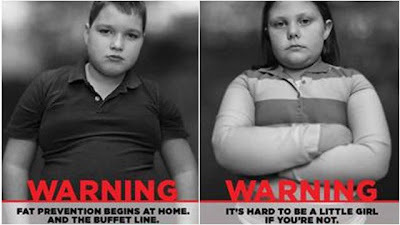 Obese children are more likely to be bullied or to experience depression. Obese adults are more likely to experience discrimination on the job (as often as racial discrimination, according to one study, and possibly more often than age or gender discrimination). And this is where I think the Georgia ads get the issue wrong. While I think we should be campaigning to "change" obese people for the benefit of their physical health, longevity, and a better lifestyle, I think we should be campaigning to change ourselves for the problems that result from discrimination based on physical appearance. Judging anyone by physical appearance is not a problem with the person being judged; it is a problem in our own hearts and minds. Sure, some people's appearances may be a clue as to what is going on inside their heads or hearts, but this is not a universal truth. No person's worth is based on his or her appearance, and we should not perpetuate that myth ever. To tell our children that we agree with the world's judgement that worth can be based on appearance is a tremendous mistake. To love someone despite their imperfections is not the same as tacit approval of their every choice. It is the nature of love itself. Some will say that obesity is lethal, so we should go to extremes to curb or prevent it, even if it means hurting someone's feelings. I would agree that a little hurt feeling in the context of an intentional and caring conversation about health is well worth it. But in my view, to bring appearance into the conversation is not simply about a little hurt feeling; it may impose long-lasting damage. It is beyond a mere temporary pain when we tell a person, with a mind and heart, that our love is contingent on a particular physique. Appealing to a child's vanity may provide short term success, but it ultimately sets the child up for long term problems. To shame a child into losing weight is putting a skewed view of personal worth on a pedestal and sacrificing the ultimate mental health of the child in order to serve the false god of physical perfection. Children are already besieged by an unending stream of messages about their physical appearance. I recently read a book called, "Cinderella Ate My Daughter," by Peggy Orenstein. While I lamented the disorganized and desultory nature of the book to my book club friends and thought the author made some grand leaps of logic, the overarching theme of the work stuck with me. Children are exposed, almost from birth, to a plethora of marketing images that tell them they need to fit into a specific mold. For girls, this mold largely leads to the conclusion that to be cool and accepted is to be "hot." A woman's worth comes from her physical appearance. Anyone who watched the Superbowl ads will likely recall the GoDaddy segments featuring scantily clad women enticing the watcher to go to GoDaddy.com to "see more." I would not have known that this is a domain name registration site had my husband not told me. Photographers secretly take pictures of every inch of cellulite on an actress at the beach and enlarge the images for the covers of the magazines we see in the grocery store. We even grow up watching soap and deodorant commercials that tell us if we buy the product, we can look like the model. I am pretty sure I get the point already. My cellulite is not acceptable, my breasts aren't perky enough, and I would never be called beautiful by a major news outlet. For a kid being exposed to this constant marketing, the idea that certain body types are more valuable may become deeply ingrained. This can lead to bullying (by the kid who thinks others are unacceptable) or a sense of shame (for the kid who thinks he or she is the unacceptable one). In some cases, both lines of thinking may be at work in the same child. It's all well and good for me to say that this is having a negative impact on obese children (and on all children, really), but what is the evidence? I submit that one important signal of the impact is the growing prevalence of eating disorders among youth. According to a study published in the American Journal of Preventative Medicine, as cited by the National Eating Disorder Information Center (NEDIC), girls who reported body-based teasing by family members were 1.5 times more likely to engage in binge eating and extreme dieting behaviors five years later. A Canadian study also cited on the NEDIC site showed that 37% of girls in grade nine and 40% of girls in grade ten wished they were thinner. Even among those considered a healthy weight based on BMI, 19% believed they were too fat and 12% reported attempting to lose weight. According to the National Eating Disorders Association, the number of young women aged 15 - 19 diagnosed with eating disorders has risen every decade since 1930. But it is not only teenagers who are affected. Psychotherapist Abigail Natenshon was cited in a recent Parenting magazine article as saying that "the average age for the onset of anorexia used to be 13 to 17. Now it's 9 to 12, and children as young as 7 have been diagnosed." In this same article, I learned that 10% of adults with eating disorders showed clear symptoms before the age of ten, and more than 60% of elementary and middle school teachers report that eating disorders are a problem in their classroom. Did you read that? Elementary school! In a 2010 article from Health Day, I learned that the Agency for Healthcare Research and Quality found that hospitalizations for eating disorders jumped 119% for kids under age 12 between 1999 and 2006. Not only that, but anorexia has the highest mortality rate of any mental illness. The South Carolina Department of Mental Health website cites a study conducted by the National Association of Anorexia Nervosa and Associated Disorders, which reported that 5 - 10% of anorexics die within ten years of contracting the disease, 18 - 20% within twenty years, and only 30-40% ever fully recover. Other sources show lower numbers - the ANAD website itself now says that the American Journal of Psychiatry (2009) concluded that the ultimate mortality due to eating disorders is 4% for anorexia nervosa, 3.9% for bulimia nervosa, and 5.2% for eating disorders not otherwise specified. One of the reasons the statistics may vary between sources is that deaths related to eating disorders may be recorded under other causes, such as heart failure. Regardless, anorexia still stands at the top of mental illness mortality. While it is important for us to recognize and address the growing obesity epidemic in our country, it is also worthwhile to pay attention to the unintended consequences of the strong rhetoric around the issue. At the same time obesity rates are growing, so are those of eating disorders and unnecessary dieting among youth. And this is only one of the potential problems that arise with such a strong focus on physical appearance. There are undoubtedly countless other emotional, relational, and even physical effects. By not telling obese kids that they look "different," we are not hiding the truth from them. Many children who are overweight, and even many who are not, are already keenly aware of how their bodies are being scrutinized. The magazines they read, the television ads they see, the kids who bully them, the employers who don't promote them, are all sending them that message already. It's true that some parents and kids need a wake up call from a medical professional telling them they are on an unhealthy path. But the message we need to send is to take care of your body, for your own health's benefit, for the enjoyment of life, and for the sake of the work that God has for you in your time here. Who you are and your personal worth as a human being are not based on how you look. Love this one! Actually just went to see a great documentary last night called MissRepresentation about images of women in the media that really reminded me of Cinderella Ate My Daughter. I definitely think this is an issue for all young people, but clearly for girls and women in particular.